Protect has been in the business of responding to hazardous material spills for over twenty years. During that time, new technologies and techniques have been introduced and marketed as a ‘cure all’ for environmental remediation needs. These new technologies may show promise in certain circumstances, but each one comes with limitations. Experienced safety and emergency response professionals can see through the marketing hype around new products. They realize that new additions to the cleanup and remediation market need to be examined thoroughly before being utilized in situations where the well being of humans and the environment is at risk. Bio-remediation in soils is an example of a technique that is recognized as being useful in some but not all situations. It can result in the breakdown of contaminants into less toxic substances, but it is a slow process. Bio-remediation works well when contaminants are minimal and mostly immobile, but it isn’t recommended in areas that are highly sensitive to the spilled material or where the material can run off into waterways. Super absorbent polymers were developed in the 1960’s and have since been used in numerous consumer and safety products. These polymers are commonly sold as absorbents for chemicals spills due to their ability to absorb and retain a large amount of liquid. Since these polymers will soak up oil products and water; however, they are ineffective at removing petroleum contamination from waterways. They will also absorb a number of different chemical products, but the user has to exercise caution since certain chemicals, such as Nitric Acid, will react with the polymer and can cause a fire or explosion hazard. Pozzolanic stabilization is very effective at removing the leaching ability of metals from waste sludges and contaminated soils, but its usefulness essentially ends there. Spills of solvents, fuels and most other waste materials should not be exposed to the chemical reactions involved with this type of stabilization. Today, chemical recovery scrubbers are commonly touted as the most effective way to clean up hazardous materials and petroleum spills. Once again, this type of technology has certain uses, but does not guarantee a quick and complete cleanup. Spilled liquid material can easily spread while a scrubber works its way through the area and rough surfaces such as concrete roadways slow down the cleanup process. Once the material reaches waterways, storm drains or soil, the scrubber is no longer effective. Non-miscible products such as oil based paint are extremely difficult to remove with scrubbers. Also, since they utilize water, it’s not advisable to use them for cleaning up corrosives or water reactive material. 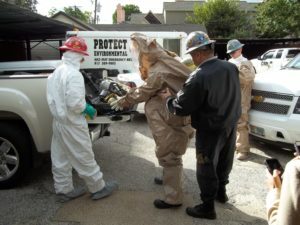 The truth is that there is no one machine or technique that is always applicable to every HazMat spill. Response contractors that lack an experienced professional staff will try to make up for it by emphasizing new gadgets and machines. Be wary of anyone promising ‘state of the art’ or ‘proprietary’ solutions since real HazMat professionals know every situation is unique and requires different strategies. Emergency response companies have to invest in new equipment and trucks to tackle tough spill situations, but the most important asset they can invest in is their employees. 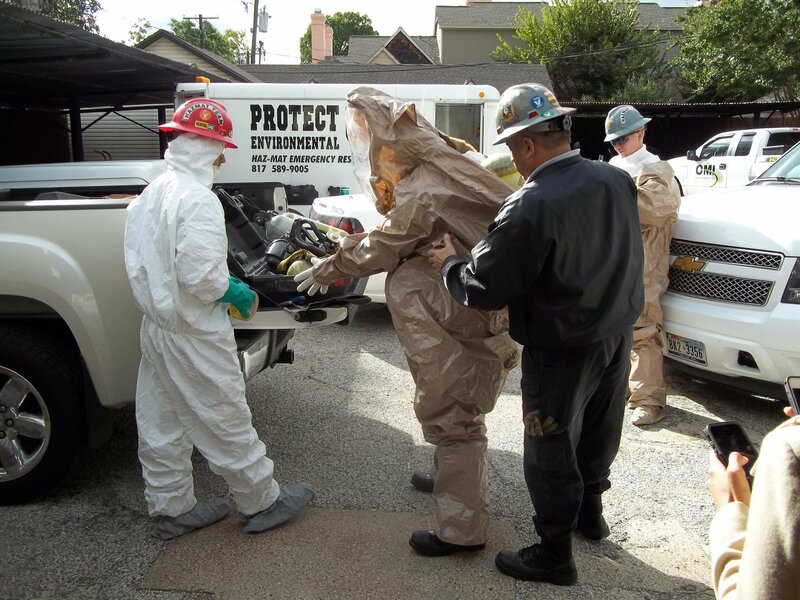 Protect Environmental has spent the past twenty-one years focusing solely on hazardous materials emergencies and special waste disposal, so our HAZWOPER certified teams have unmatched experience. They know how to properly analyze and respond to any spill situation while complying with State and Federal laws. Every member of our staff believe in what we do and work hard to give our clients the best possible outcome when spills strike. That is the secret to HazMat response. Businesses that generate hazardous chemical wastes as part of their day to day operations are typically up to date on the requirements put forth by the EPA and the TCEQ. Large and small quantity generators track waste shipments and report their waste activities to the state, but generators who don’t produce hazardous waste on a regular basis aren’t required to follow the same guidelines. The EPA created the category of ‘conditionally exempt small quantity generators’ for organizations that periodically find themselves needing to dispose of hazardous waste because of special projects or other sporadic events. These generators are allowed more flexibility when it comes to storing and disposing of wastes, but that doesn’t mean that hazardous wastes should be stashed away and forgotten. Any material stored on site that can adversely the health of the employees or the environment poses a potential risk for the business that has possession of it. Companies that store large amounts of hazardous products on site with the intention of using them are also at risk. Allowing chemical products to pile up, whether they are wastes or not, increases the chance of having a spill that can lead to employee injuries, government fines and lawsuits. The likelihood of costly spills or accidents is greatly reduced. Mishandling of some materials can result in severe injury or death. Make sure products are stored according the manufacturers recommendations: When materials are stored in conditions that destabilize the product, hazardous chemical reactions can occur. Bulging drums, toxic gases and fires are just a few of dangerous consequences. Don’t buy large amounts of the material unless you plan to use it within a few months: Each organization has to weight the costs and benefits of buying products in bulk. Carefully consider the cost savings of buying and storing products versus the cost of dealing with an accidental spill. Dispose of outdated or excess materials as soon as possible: Some companies will accumulate waste materials for years before trying to dispose of them. As time goes on, the cost of disposal services rises and rusted or damaged containers can make it more expensive. Staying on top of disposal on a regular basis can prevent budget-busting problems down the line. Contact an emergency responder before an emergency: A quick and efficient cleanup after a spill is crucial to getting back to normal operations. The contractor must be reliable, knowledgeable and have the right equipment for the job. Rather than frantically searching for a responder as an accident is unfolding, take the time to find the right one before disaster strikes. Protect Environmental has dedicated the past twenty-one years to emergency hazardous materials cleanup and special waste disposal, so we have a proven track record when it comes to helping our clients cope with spills. We invite you to contact our office and build a relationship before you ever need us for an emergency. Keeping hazardous material safety and disposal near the top of the priority list leads to long term benefits for small businesses. With these tips in mind, managers and safety officers can help protect their assets, their employees and the future of their companies.